Note: Templates for merge requests were introduced in GitLab EE 6.9. Templates for issues were introduced in GitLab EE 8.1. Templates help filter out a lot of unnecessary noise from issues, and with GitLab you can do that pretty easily. Note: Make sure that the issues feature is enabled in your project's Settings otherwise the template won't show. This is the default behavior so in most cases you should be fine. To enable the template feature for your issues, go to your project's Settings and fill in the Description template text area under the Issues feature. Since GitLab issues support Markdown, you can use special markup like headings. After you add the description, hit Save for the settings to take effect. Now, every time a new issue is created, it will be pre-filled with the text you entered in the template. Note: Make sure that the merge requests feature is enabled in your project's Settings otherwise the template won't show. This is the default behavior so in most cases you should be fine. 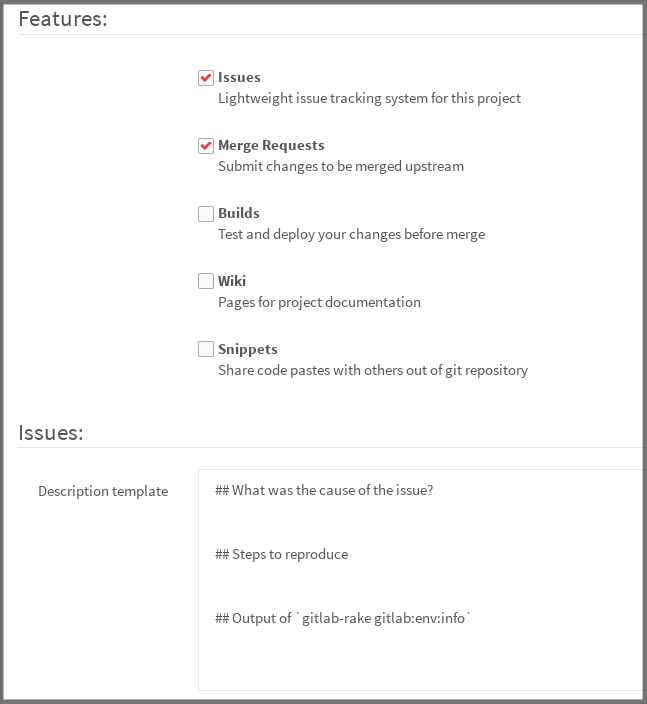 As with issues, you can create a template for your merge requests as well. Remember that GitLab supports Markdown in merge requests. From now on, any new merge request will be pre-filled with the template text.